Platinum metallic base offers a height range of 26" to 43"
Revel in an adjustable height desk that gives you a more comfortable worksurface for all of your tasking. It's the Steelcase Airtouch Height Adjustable Desk and it's ready to give you 17" of height adjustments quickly, within just a few seconds for more ergonomic work you can feel. 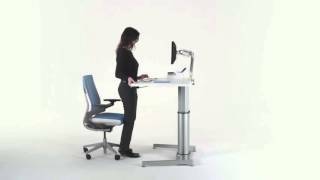 The desk lifts 150 pounds including the desktop for better work on your preferred levels, and requires no electricity to do its thing, relying only on a pneumatic lift to get you to the sit-to-stand sweet spot. Ideal for raising and lowering light to heavy-duty desk setups even with multiple monitors due to an adjustable feature on the lifting column that allows you to fine-tune the amount of lift necessary for various loads up top. Get the simple and adjustable standing desk of dreams with the Airtouch Height Adjustable Desk by Steelcase and see what a more ergo-friendly workstation can do to uplift your work and productivity. The Steelcase Airtouch Desk offers four surface laminate colors to choose from that coordinate with the silver desk base. $1,674.00 List Price: $2,499.00* The list price is the same as the MSRP (Manufacturer's Suggested Retail Price). It may not necessarily be the price at which the product is sold.